Lunch lady and the Mutant Mathletes by Jarrett J. Krosoczka. Random House, 2012. 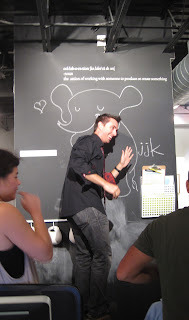 Krosoczka absolutely connects with young readers through his art and his sense of humor. I personally believe his insight stems from his time working at the Hole in the Wall Gang camp. It may be a chicken and egg thing. Did he work there because of this focus or did he gain it from working there. Dunno. My niece told me that she really, REALLY liked the Babymouse books I sent her but she LOVED the Lunch Ladies. Krosoczka is awesome. I loved watching the BEA youtube video of the Guys Read panel from last year-- he rocked some red pleather and talked about reading Anne of Green Gables in middle school It was great. Good luck with the challenge. I know how popular the Babymouse series is, so if this is even better . . . wow. I almost read this one for the #48HBC, but got impatient for a quick read a day or two before. I think of these books together with Babymouse, too. I love the Lunch Ladies...and yes, Jarrett is so special. I love hearing him talk about his work at Hole in the Wall Gang camp! Best wishes, Book People Unite!